Go Ahead Funding equipment financing has specific advantages over other types of financing or purchasing with cash that can be crucial to your company’s success: The term and payment structure of the equipment lease are fixed once the lease is approved. You know exactly what your payment will be every month and to help you better forecast your cash flow. 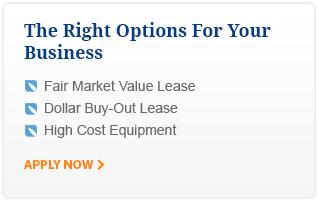 Go Ahead Funding offers commercial leasing for large equipment purchases over $100,000. Many banks will include equipment leases on your business available credit and reduce your credit line limits accordingly. By doing business with Go Ahead Funding, your equipment leases won’t affect your available bank credit. For more information call us today at 888-454-8347 or click on the Apply Now! button at the top of the page for free evaluation.